Tension ties offer a solution for resisting tension loads that are fastened with nails. The HTT4 and HTT5 feature an optimized nailing pattern which results in better performance with less deflection. HTT5KT is sold as a kit with the holdown, bearing plate washer and Strong-Drive® SD Connector screws. The HTT5-3/4 is designed to use a 3/4"-diameter anchor bolt. 3/4" post-installed anchor bolts are commonly used when retrofitting tension ties to horizontal wood members. The LTT19 light tension tie is designed for 2x joists or purlins and the LTT20B is for nail- or bolt-on applications. The 3" nail spacing makes the LTT20B suitable for wood I-joists with 0.148" x 1 1/2". The LTTI31 is designed for wood chord open-web truss attachments to concrete or masonry walls and may also be installed vertically on a minimum 2x6 stud. Galvanized. May be ordered HDG; contact Simpson Strong-Tie. See Holdown and Tension Tie General Notes. A standard-cut washer is required for LTT19 and LTT20B when using 1/2" or 5/8" anchor bolts. No additional washer is required when using a 3/4" anchor bolt. For information about marriage strap at panelized roof applications, see MSTD. HTT5-KT requires BP 5/ 8-2 bearing plate and SD10212 Strong-Drive screws (included in kit). Submittal/substitution request for S/LTT, S/DTT and HTT tension ties for cold-formed steel construction. A submittal/substitution request for S/LTT, S/DTT and HTT tension ties for cold-formed steel construction. Raised Simpson Strong-Tie® holdowns in wood-sheathed cold-formed steel framed shearwalls. LTTI31 installed flush with concrete or masonry has an allowable load of 2,285 lb. Allowable load for HTT5 with a BP 5/ 8-2 bearing-plate washer installed in the seat of the holdown is 5,295 lb. for DF/SP and 4,555 lb. for SPF/HF. 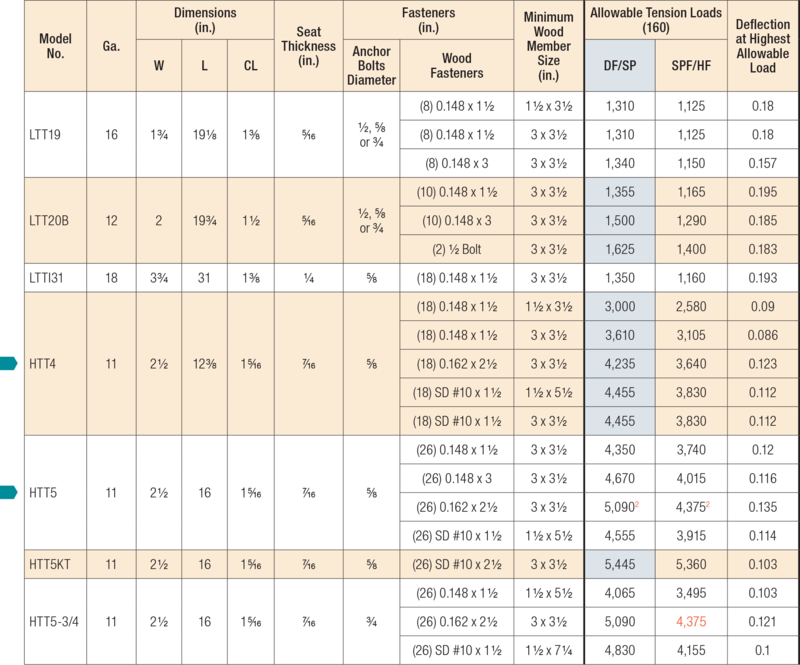 Fasteners: Nail dimensions in the table are listed diameter by length. SD and SDS screws are Strong-Drive® screws. For additional information, see Fastener Types and Sizes Specified for Simpson Strong-Tie Connectors. HTT See specific model numbers for code listings. LTT See specific model numbers for code listings.